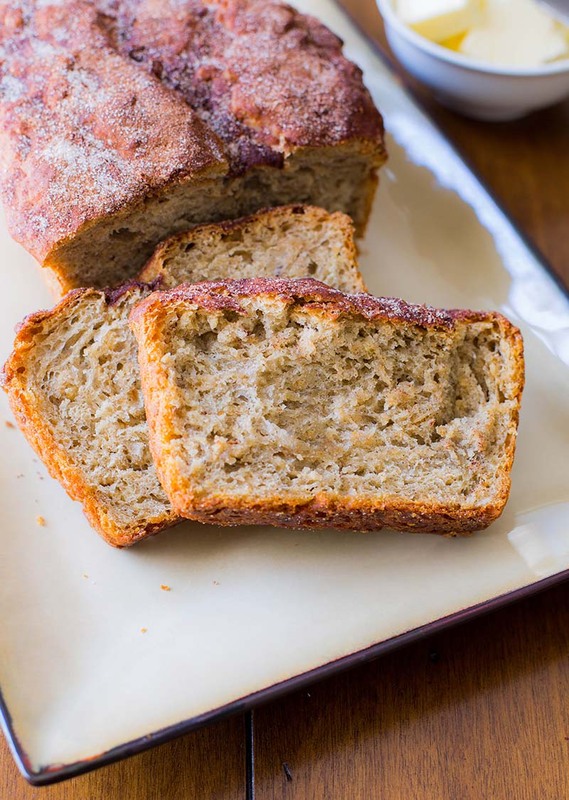 A delicious no-knead bread, slightly sweet with a cinnamon and sugar crusted top. In a large bowl, mix together bread flour, oats, cinnamon, salt, and yeast. Set aside. In a small bowl, whisk the honey and oil together. Add the cold water. Add the wet ingredients to the dry ingredients, stirring with a wooden spoon. Scrape down the sides as needed with a rubber spatula. If the dough seems stiff, add more cold water (1 tablespoon at a time) until the dough is soft. The dough should not be dry because the oats will draw up moisture. It will look sort of slick on top; that is ok.
Spray the top of the dough with nonstick spray or lightly coat with oil. Cover the dough tightly with plastic wrap and allow to rise at cool room temperature (about 70°F degrees) for 12 hours (or overnight). Spray a 9x5-inch loaf pan with nonstick spray. Set aside. The dough will have risen quite a bit after 12 hours. Using a wooden spoon or rubber spatula, stir in enough additional bread flour to yield a hard-to-stir consistency, about ⅓ - ½ cup more bread flour. Coat your spatula with non-stick spray and fold the dough in towards the center all the way around. Place the dough into prepared loaf pan. Brush the top of the bread with oil or nonstick spray and smooth out the surface. Using a sharp knife coated in oil or nonstick spray, slash a ½ inch cut into the center of the top of the loaf. Cover the pan with non-stick spray coated plastic wrap and allow to rise for another 1-3 hours in a slightly warm environment, until dough is slightly above edge of pan. Move the oven rack to the lower third of the oven. Preheat to 375°F degrees. Make the topping: Combine cinnamon and sugar in small bowl. Stir to blend. The dough is ready after it has risen about ¼ inch above the pan's edges. Remove the plastic wrap and sprinkle the top of the loaf with cinnamon and sugar. Bake bread on the lower rack for 35 minutes. Remove from the oven and cover with foil. Continue to bake the bread for another 40-45 minutes, or until a toothpick inserted into the center of the bread comes out clean. Remove foil. Allow the bread to cool in the pan, placed on a wire rack, for about 15 minutes. Remove the bread from the pan and allow to cool completely on a wire rack before slicing. Serve cool or toasted.